Growing up near Sun Valley, a popular ski area, Picabo Street hit the slopes at an early age. She was a tomboy, playing sports with the boys and beating them whenever she could. A naturally talented downhill competitor, she joined the U.S. junior ski team when she was only 15 years old and went to train with the U.S. ski team. Street won the national junior downhill and super giant, or Super G, events in 1988. Disturbed by her lack of discipline and poor physical condition and attitude, officials from the U.S. ski team suspended Picabo Street in 1990. In the face of this rejection, she went to Hawaii to train with her father. Street returned the next year, stronger and more committed to the sport. She proved to be a tough competitor, coming in third at the U.S. Championships that year and winning the Super G event at the U.S. Championships two years later. By 1992, Picabo Street was ranked eighth in the world. Two years later, she had her first taste of Olympic victory, securing a silver medal in the downhill competition. Also in 1994, Street became the first American woman to win the World Cup women's downhill competition. She earned the top spot again in downhill at the World Cup in 1996, but later endangered her dreams of Olympic gold when she injured her knee during a training run. The recovery process--which included surgery and physical therapy--was long and difficult, but Picabo Street made it back to fighting form by the time of the 1998 Winter Olympics. All her hard work paid off. She won the gold medal in the Super G event. 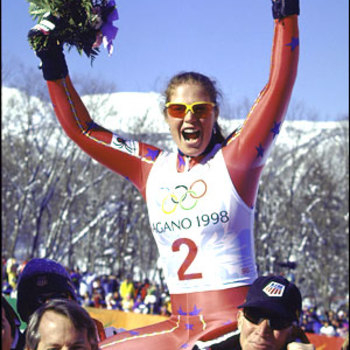 Unfortunately, Picabo Street didn't have long to savor her victory when tragedy struck again at the World Cup in March 1998. During the competition, she slammed into a fence, breaking her leg in multiple places. Street had to endure several operations to fix the leg and was out of competition for more than a year. Despite this setback, she refused to give up and, after her recovery, committed herself to training. Street qualified for the 2002 Olympic Games. 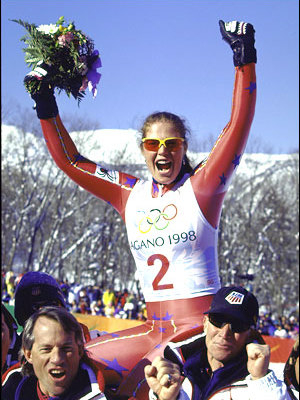 Although she had made an impressive return, Picabo Street finished sixteenth in the women's downhill event at the 2002 Olympics. She retired from competitive skiing after this competition. That same year, Street's autobiography, Picabo: Nothing to Hide was released. She now lives in Portland, Oregon, and has served as the spokesperson for several companies and sports organizations.